Learn how to play Craps and win IN THREE MINUTES! Craps is one of the most exciting gambling games since…the Middle Age! If you don’t know how to play Craps and you haven’t played online yet, now it's your chance. What you see here is the only craps for dummies guide you'll ever need to learn the game, discover the best strategy tips, and win at home or in Las Vegas. Although it's one of the most popular and played games at land-based casinos, the game of craps not one of the top favourites of online players. Some believe craps is a complicated game with rules and bets that do not fit the speed of online gambling. They get confused by concepts like odds bets or betting on the pass line - and that’s why they often skip this amazing table game. Do you want to hear the truth? They are wrong. The game of craps is super-easy and super-fun also when you play it online. To prove this, I am going to use this Craps for Dummies online guide to help get your first game started and to suggest you some beginner-friendly online casinos you should try. How to Play Craps for Beginners? If you are one of those who believes craps is a difficult game to learn, you should know that my mission here is it to change this. Beginners are often so intimidated by the numbers, the terms, and all the different bets available in a game of craps. Also, complicated tables like the ones you find on Wizard of Odds might push you away from the craps tables and not play the game. I get it. I have been there. At first glance, it might seem a lot to take in. Playing craps is easy. You don’t need anything more than a guide for Dummies like this one to move from beginner to pro in less than one day. After all - you either win or lose. If you don’t know how to play craps, make sure you read the part that follows carefully enough to pay attention to all the different elements that compose a game of craps. When you are done with my Craps for Dummies guide, you are ready to play the game. Once you pass the learning part, the game is simple. 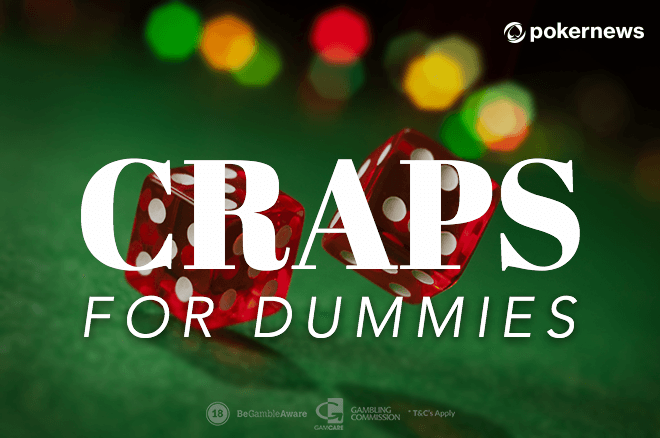 So, let’s not beat around the bush and get to the good part – craps rules for dummies, that is. Why three minutes? Because there are three main rules to learn to know how to play craps. This is a guide for dummies - meaning we like to keep things short and simple. That’s why three minutes is more than enough to learn how to play craps. Craps betting round starts with a come-out roll. That’s the first term beginners need to learn and add to their vocabulary. The come-out roll is the first roll of the dice or the first one after the previous betting round has finished. The player who throws the dice is called the 'shooter'. A game of craps plays as follows: you, 'shooter', take two dice and throw them on the craps table - or press 'roll' button if we are talking about online craps. Here’s when things get really good. A 'Natural' means that the result of your roll is a 7 or an 11. When this happens, you win and get to roll the dice again. You roll a 2 (also known as the Snake Eyes), 3, or 12. Here’s when you lose. BUT the round is not over, and you get to roll again. You roll a 4, 5, 6, 8, 9, or 10. In a live casino, a dealer would mark your Point (the rolled number) on the table. In online craps games, there is a small button that appears once the Point is established. It’s white and says 'On'. What you need to do now is to roll the dice once more and hope you’ll hit the same number again. It doesn’t have to be the same combination of dice as you had before. As long as it’s the same sum – you win. Do you know why the sequence above misses a seven? The number 7 is not a very lucky one in this case since if you roll a 7, you 'seven out' – you lose and end the betting round. Once you learn this part by heart, you can move on to the betting options. That’s the fun part. Because that’s the one that can make you win a lot. If you take a look at the craps table, both online and offline, you can see that it’s not only dice and numbers. Now that you know how to shoot craps and how to evaluate the result of your roll let’s have a look at how to bet in a game of craps. Remember: this is a craps guide for dummies, so I am going to analyze everything looking at a game of craps as a beginner would do. 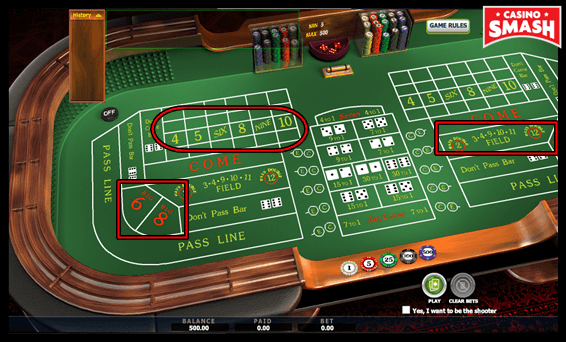 The layout has a handful of areas for different betting options. First, you can bet either on the 'Pass Line' or the 'Don't Pass Line'. The Pass Line bet means you bet that the shooter will pass (win) by rolling out a natural or by winning the point before seven-ing out. The Don’t Pass Line corresponds to the opposite bet. In this case, you bet that the shooter will not pass (lose). It can happen if the player shoot to get a 2 or 3, or fails to roll the point again before a 7 shows up its ugly head. And then there is a 12. If it’s rolled now, your bet is a Push – meaning nothing happens. You don’t win, but you don’t lose either. You can make these bets only before the point has been established on the table. Once the point has been rolled out and the shooter needs to roll the sum again, you can make a come or don’t come bet. These bets can only be made after the point has been determined. The Come Bet wins if a natural is rolled out and loses if the craps are. If the point is rolled out, it becomes the Come-Bet point. It works just like the Pass line one: if the come-bet point rolls out again before 7 does, you win. If not, it’s not your lucky round, pal. Don’t come bet is just like the Don’t pass one. You’re in luck if the shooter rolls a 2 or 3, not so much if it's a 7 or 11. A 12 here is a push again. Once the point is made, you should hope for 7 before the shooter rolls out the point again. Neither Pass nor Come bets can be turned off. You bet and wait until it plays itself out. But you can make additional bets on the come-bet point, too. And those you can withhold or increase at any time. These are one-roll bets (with one exception, as you can see in the table below) that you can place on any roll. Place Bets:Once you know the point, you can bet on any number on the table. You win if it’s rolled out before a 7, you lose if it isn’t. Field Bets: This type of bet is only active for one dice roll. You win if a 2, 3, 4, 9, 10, 11, or 12 is rolled. A 5, 6, 7, or 8 makes you lose. Big 6 and Big 8 bets: If you want to bet that 6 or 8 will be rolled before 7, These are the two bets for you. These bets only pay 1:1. The best way to learn craps online is to practice craps online. And if you don’t want to risk your cash on real money games until you are 100 percent sure that you know how to win at craps - that’s not a problem. The best site to play craps online for free and get a hang of the game is this one. I’d say it’s the best craps platform for dummies you can find online. And not only for beginners. I love it even as a (semi) pro craps player who plays only for money. I suggest you open a free account on this page to find the best Craps tables online and play the game. That’s the best way to learn craps if you don’t have a brick-and-mortar casino next door to go to. That’s what I did when I first played Craps. It all will look a lot easier once you practice craps online. And once you feel that online free practice has made it perfect, you can move to real money craps games. The game of craps has really good odds with the house edge of only 1,41%. That beats roulette and even blackjack when it's played with the basic strategy. There’re many betting rules to remember at first but they come naturally later on. And they actually make the game even more exciting. So, do you want to win real money? Then you need a casino with a decent payout. And better yet, a good bonus offer. Real money Casino sites - and this is valid for UK Casinos and Canadian Casinos too - give you extra bonuses to play the game on nearly every deposit you make. As it's stated on the Casino FAQ, you can always top up your deposits with extra bonus money to play the game or even some handy free spins to enjoy Slots when you want to kill some time. And once you have enough bonus money to try all the bets in Craps, you'll be a craps pro in no time.